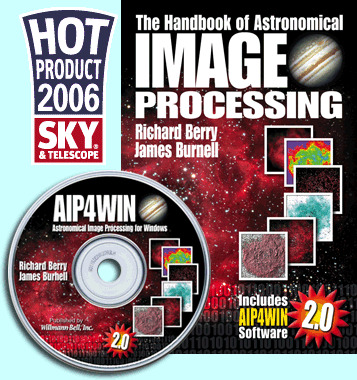 Enter the world of image processing with a solid grounding in the fundamental tools of image processing. Covers CCD operation, image file formats, computer displays, histograms, linear and non-linear brightness scaling, convolution and deconvolution filters, noise reduction, masking, merging, summing, and saving images. Includes AIP4Win software and over 600 MB of sample images. For CCD imagers who want a powerful, flexible, and easy-to-use image processing package. Coauthored with Jim Burnell. 684 pgs, 6 x 9. Click here for more information on the book and the software.